Here is a great photograph of children swimming in the Tolka River. 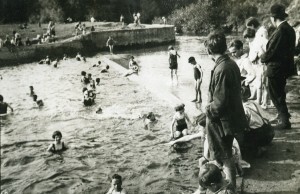 This swimming area was situated further upstream from where Lemons Sweets Factory was in Drumcondra. Unlike the Cabra Baths both boys and girls were allowed into the water at the same time. One young girl is holding a small child almost in the centre of the picture. The man on the right is wearing a bowler hat and bicycle clips. The young lad with his hands in his pockets may not have had any swimming gear and just stands looking at all the fun going on in the water. There are at least 24 children in this small stretch of water. Whatever became of this swimming pool, when and why was it ever closed? Did you ever swim here?